Because custom orders do not require the expense of warehousing, our ability to “make and ship” can reduce your cost per bag. Minimum quantity requirements vary greatly for custom runs, as smaller bags require more and larger bags require fewer total bags to meet minimum production requirements. Food Grade bags keep ingredients clean, reduce tampering and offer containment of their contents. They may be used internally, inside of a box or envelope shipped to your customer or as the exclusive means of packaging from production to the shelf. Our highly trained representatives are available to assist you with selecting correct sizing, gauge and other qualities to best suit your desired use. The vast majority of bags offered for sale at DiscountPlasticBags.com are “Food Grade.” For your reassurance, you will see an icon which says “FDA” on the individual product description pages. Food Grade Poly Bags are made from raw materials approved by the FDA/USDA, in an environment approved by the same agencies and packaged with the agencies’ approval. This is accomplished by using virgin (not recycled) polyethylene resins in a clean environment, then packaging them in a manner where they will not become contaminated during shipping. Polyethylene is not the only raw material which may be approved for food contact by the FDA and USDA. Polypropylene, Poly Nylon, Coextruded LLDPE/PET and several other products on our pages are food safe. The “FDA” icon may be found in the product details pages of these products, too. 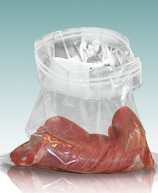 Custom food grade poly bags can offer significant savings for volume users. If you are purchasing over $1000 of any particular size, check with us for the possibility of receiving a custom quote. In addition to the savings, custom runs can offer more precise sizing and customized case counts.